In short: This is an autonomous and automatic watering system that works with solar and rainwater collection tank. 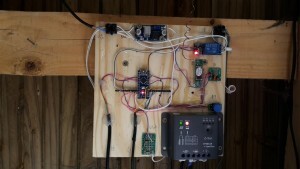 This instalation works with an Arduino Nano USB board and various sensors and RF modules. Everything is controled and sheduled using my central domoticz on Raspberry B + with a RFXCOM for RF communication. Purpose: The purpose of this stuff is to automatically water my little piece of vegetable garden depending on the temperature of the day, the last rains, the water level of the tank, level of battery and rain forecast in the commings hours. My references: Of course I am not the first one to start this adventure. I found a lot of people on the internet who explained in detail the assembly with similar constraints. The more detailed and closer to my editing is serreecolo.blogspot.fr (in french) blog which in 2014 introduced its completely autonomous and automatic watering of a greenhouse. this one is quite detailed APIS – Automated Plant Irrigation System but requires a power source. Anyway today it is my turn to make the job and detail my setup … Hopefully i will be usefull for someone else too…?